“So many people, particularly in academe, end up doing something that they had no idea they'd be doing, and that's what happened to me,” says Paul Hardin, former Chancellor at The University of North Carolina at Chapel Hill. Throughout his life, Hardin has had various professions including lawyer, professor, university president, and even politician. After teaching at Duke, Hardin decided to make another career change and he ran for mayor of Durham. He won the primary race, but lost the runoff election. He adds, “I may have lost that mayoral race, but sometimes when you think you've lost, you haven't really lost at all. If I had won, I probably would've ended up becoming a North Carolina politician instead of a university administrator. Losing that election made it possible for me to accept the offer to become President of Wofford College.” He served as President of Wofford for four years from 1968-72. 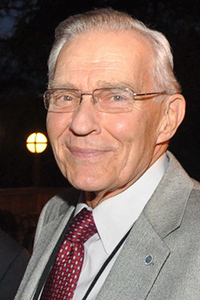 Hardin went on to have a successful career in higher education administration serving at institutions like The University of Alabama at Birmingham, Southern Methodist University, Drew University and UNC-Chapel Hill. While at SMU, Hardin discovered cheating in the football program and self-reported the indiscretions to the NCAA, even before the organization could begin an investigation. He also fired the school's athletic director. However, soon after this scandal, Hardin left his position at the university due to disagreement about the situation with the Board of Trustees. He then became President of Drew University for 13 years. Towards the end of his tenure at Drew, he received a call regarding a position as Chancellor at UNC-Chapel Hill. He says, “At the time, UNC had fired its football coach and there were criticisms of an overemphasis in sports at the University. So they were looking for someone who loved athletics, but had a record for not putting up with any nonsense.” Hardin's treatment of the cheating scandal while at SMU made him a strong candidate for the position at Carolina. He was also excited to return to his home state. “My wife and I always wanted to come back to North Carolina. But who would've thought that an old Dukie could become the Chancellor of UNC.” Hardin served as Chancellor at UNC-Chapel Hill from 1988-1995. Hardin reflects on his time at UNC-Chapel Hill, and the difference in presiding over a public university and a private institution. “I was accustomed to the private sector, where all I had to do was get the support of my board of trustees' support to accomplish things that would benefit the faculty and students. As Chancellor at UNC there were many layers of responsibility. I not only reported to the president of the system, but was also accountable to the faculty, staff, students, and the legislature. My political background made me comfortable doing that. But memory must be merciful because I don't remember anything negative about my experience at Carolina. That was certainly the high point of my career.” He says one of his greatest accomplishments during this time was celebrating the school's Bicentennial, with a fundraising campaign exceeding $400 million. 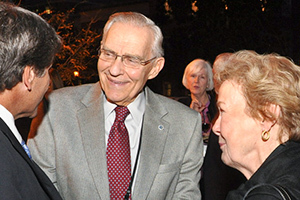 Chancellor Emeritus Paul Hardin and his wife, Barbara, with Dean Steve Matson at the Royster Society of Fellows 15th Anniversary Celebration of Excellence, for which Hardin was a featured guest speaker.